A suspect was shot during a robbery attempt in a McDonald's drive-thru on Indianapolis' northeast side Thursday evening. 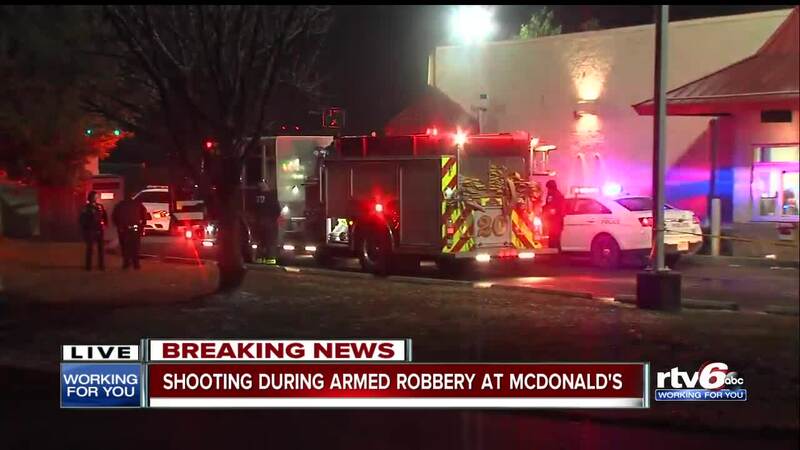 INDIANAPOLIS — A suspect was shot during a robbery attempt in a McDonald's drive-thru on Indianapolis' northeast side Thursday evening. Indianapolis Metropolitan Police Department officers were called to the scene in the 2500 block of Emerson Avenue for a report of a person shot. The victim told police the suspect tried to rob him at gunpoint and the two fought over the gun. During the struggle, the suspect was shot. He was taken to the hospital with non-life threatening injuries. Police say he is not cooperating with their investigation. Police say the victim was shaken but was not injured during the struggle. The shooting remains under investigation by IMPD if you have any information call Crime Stoppers of Central Indiana at 317-262-8477.